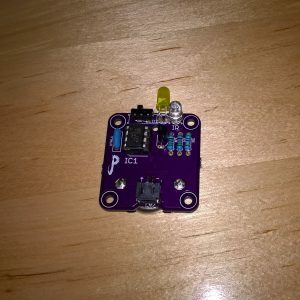 I have, since rev “A”, build a new AVR ISP tool that I use to program my boards. (GitHub or OSH Park) This makes programming the rev B board much easier, since you don’t actually solder the ISP header onto the rev B board; you just “wedge” the pins into the vias during programming. … I guess that was it. I thought there was more than one, but I can’t remember it now. Perhaps it was unimportant. Next up, I have a revision “D” board coming which uses the SSOP8 package of the ATTiny45 and is smaller, even, than this board. For those keeping score, yes, there is a “C” board–it uses a SOIC8 ATTiny, and I realized, before ordering the board, that it was the wrong footprint for the part I had ordered. But I liked the design, so I kept it and made revision “D” instead. I looked around and could not find the version of roomba you have? I have the latest version Roomba 980 and would love to try out your project. 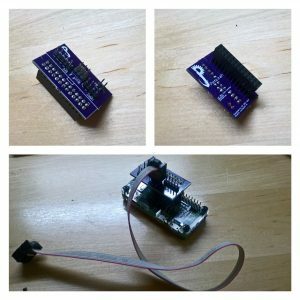 Would my Roomba be compatible with your project? I ordered roomba virtual Wall v2 rev.2 I wanted to program ATTiny85 chips with a universal TL866 programmer. What files should I use? Hi! The source code for the firmware is in the “firmware” subdirectory. If you have GNU Make and AVR-GCC (and AVR glibc) installed on your development machine, running the “make” command from that directory will generate a *.hex file that you can program with your programmer of choice. (This process works on Mac, Raspberry Pi, Windows and Windows with WSL–I’ve done it on all.) I hope that helps! Hi, I’m not practical I can not generate the * .hex file. You can not help me and send me the .Hex file in email.